Hey, you know that company that feminists are slavering over, because of all the wonderful work they’ve done for women’s self-esteem, especially average-sized middle-class conventionally-beautiful able-bodied women? The one that talks about how women can be strong, independent, and confident? The one that has a global campaign, “Beyond Stereotypes”? That one? Can we look forward to a CGId Clinton doing the Bom Chicka Wah Wah dance next? Oooh! Maybe a dubbed Obama extolling the virtues of skin whitening creams! Excuse me while I go weep for humanity now. Okay, I totally cracked up laughing at the suggestion of an animated Clinton doing the Bom Chicka Wah Wah dance. If there ever was such a commercial, I would be appalled, of course. But somehow in the abstract, I find it to be hilarious. I don’t think that the Bom Chicka Wah Wah music has anything to do with it . . . but I find the idea of an animated Hillary, particularly an animated dancing Hillary to be endlessly amusing. To be fair, I’d probably laugh at an animated dancing Obama, too. I’m such a child. I wrote the most long-winded comment to this and then just lost it all. So for my sake and yours I will try and be more succinct this time. (P.S. I wasn’t that succinct, sorry). I think politicians are fair game for ridicule. It is part of the reality of public life. However the constant ridicule of Clinton is offensive, the fact that women politicians are more persistently reduced to ridicule is offensive to me.. but not sure if this ad in itself is all that offensive to me. The premise behind the Axe commercials, that the scent will be so powerful that women will be driven by lust rather than rational thought is not offensive to me. What I find offensive is the way they often depict women in their state of driven lust – ie. the bom chika wah wah thing. 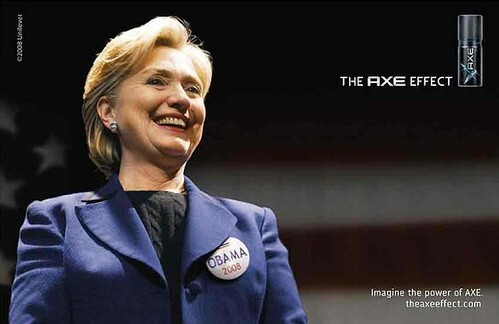 Which Clinton is not reduced to in this ad, her clothes are on, she’s upright, she’s looking pretty dignified. Clinton being attracted to her political opponents isn’t particularly offensive to me. What would have been offensive to me would have been if she was depicted wearing a pin for some mens rights crazies organisation or something like that. I would have found the implication that mens rights crazies and their misogyny could ever be attractive to women offensive, I would have found the idea of some kind of love hate thing existing between feminists and misogynists repulsive. But a joke about Clinton being attracted to one of her opponents (who aren’t unattractive men) is childish but not offensive to me. I followed the link to Feministing that you provided and saw that they have also found this ad to be very offensive, in fact they’ve found it to be the most offensive Hillary joke ever.. whereas I find the jokes about her femininity or the lack there of it, her ways of dressing, her emotions sufficient or otherwise, much more offensive. blue milk: I wouldn’t have a particular problem with the notion of Clinton being attracted to someone, though the exploitation of that in advertising would elicit an “ew” reaction. This ad goes further than that, however. 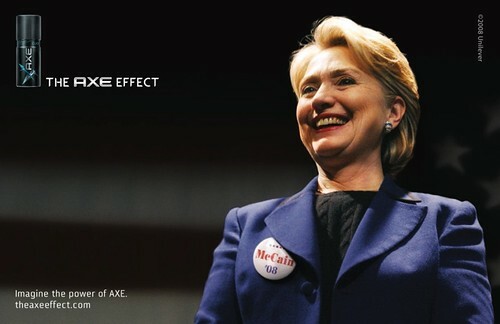 Firstly, the fact that it’s an Axe ad brings up all the previous Axe ads we’ve seen. All that bom chicka crap is in the background; the ad can’t stand on its own. Secondly, it doesn’t depict Clinton as merely being attracted to Obama; it depicts her as giving up her career and aspirations based on the smell of the ghastly teen-toxin, and throwing her hat in the ring as a campaign subordinate. There’s more to the ad than “attraction”. There is complete subordination of all of her other desires, her life’s work, in every way. This, to me, is a MORE offensive insinuation than just making someone dance like a pornpuppet. And then there’s the McCain ad.